Easy bacon wrapped meatloaf for a simple weekday meal. 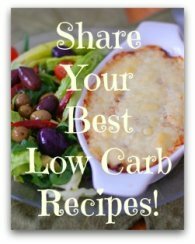 Ketogenic too! This bacon wrapped meatloaf came about when I got to thinking about how much I love a good steak topped with a hunk of blue cheese. Well, I didn't have any steaks on hand but I had a pound of ground beef. I'm a resourceful kinda gal so I got it in my head to mess around with a few ingredients available from my refrigerator. There was a bit of spinach in the crisper drawer and some leftover olives from a dinner party the night before, a farm fresh egg and of course some awesome quality Danish blue cheese. So I poured a glass of Pinot Grigio and proceeded to create a most tasty and upscale kind of meatloaf, ever. Yeah me!!!! Serve with steamed asparagus or broccoli or French green beans as shown here. 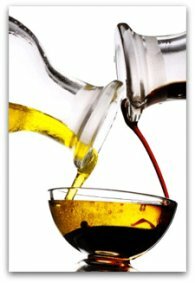 Oh, and one more thing...I didn't use any salt because the cheese, olives and bacon contain plenty and I was concerned it would be too salty. I was right to hold off. Pre-heat the oven to 300F. 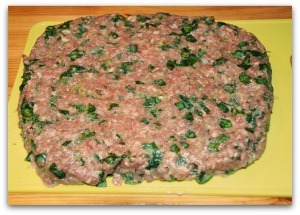 Mix the ground beef with the garlic, onion and spinach. Lightly beat the egg and mix it in thoroughly with the meat mixture. 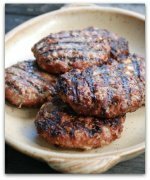 On a cutting board, flatten the meat mixture into a rectangular shape, about an inch thick. 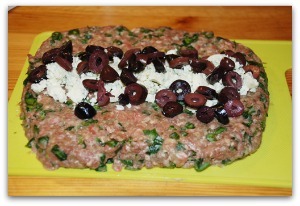 Place blue cheese and olive slices down the middle. 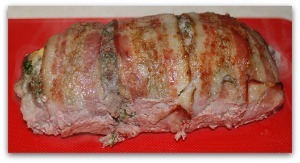 Fold the meat around the cheese and carefully shape the meat into a loaf, ensuring there are no openings. Place on a plate for now. Lay the bacon down vertically on the cutting board, place the meatloaf in the middle of the bacon horizontally. 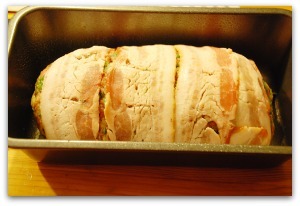 Pull the bacon strips around the loaf. Lift the meatloaf and place it seam side down into a small loaf pan. Bake uncovered at 300F for 45 minutes. Drain the pan. Increase the heat to 350F and bake an additional 15 minutes, drain the pan again. Continue baking for an additional 15 minutes. Use a serrated knife for slicing. 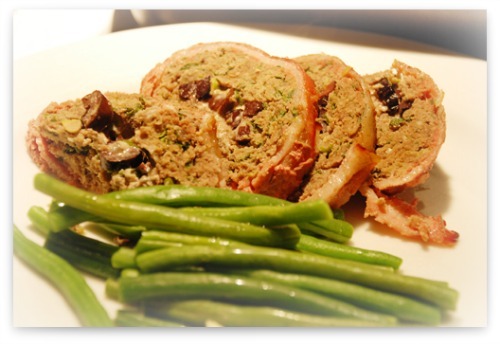 OK, let's go from the bacon wrapped meatloaf page, back to the Home page.